Sheri of Whole Circle Studio designed a first: a complete English Paper Pieced alphabet! To celebrate and spread the word, she asked as many makers as there are letters in the alphabet to participate and make projects using one letter. I chose “C” because my last name is Curtis. When I paper piece, I baste using Sew Line glue pens and sew using Superior Threads Bottom Line and Tulip Milliner Needles. 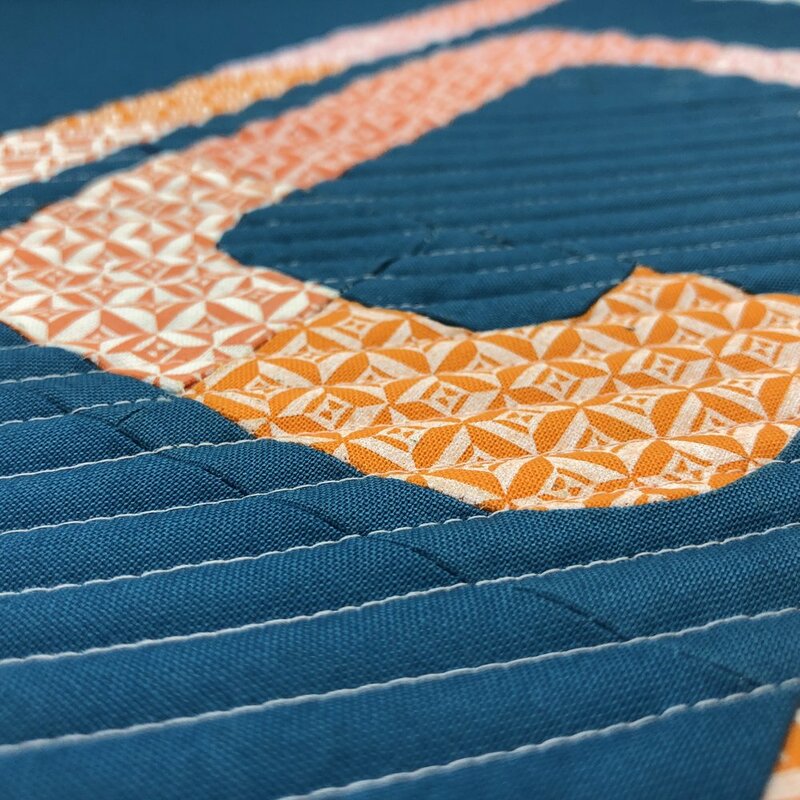 The fabric I chose is a really special fat quarter bundle I got from Karen Lewis Textiles’ shop - she periodically screen prints onto Kona Cottons and sells small amounts. The Bobbin print and the peaches and pinks were irresistible to me! I’ve been studying my color wheel and chose a gorgeous blue from the opposite side of all those warm colors and I think the combination is a really happy one. The finished block is about 9.5 x 6 and looked like it could make a great case. I decided to make the Oh Zipped Case by Oh How Sweet Co. I’ve seen so many of these and the size and shape seemed great for English Paper Piecing on the go. The tutorial from Oh How Sweet Co is free, easy to follow, and extremely well written. I quilted the sandwich of exterior, Bosal foam interfacing, and lining fabric before sewing the case together. That’s how I would do it again in the future. It looks really cool and the parts come together a bit easier I think when the main panel is quilted. (Also, Bosal foam is great to work with!) After machine sewing the binding around the edges, I trimmed the seam allowance before folding it over and hand stitching as instructed, and that helped a ton! Before I trimmed, I couldn’t wrap the binding all the way around enough to cover the machine stitching on the right side. I would trim again in lieu of making the binding wider. I’m stoked with how this turned out! It’s a great case with lots of pockets and even little straps for thread spools or a glue basting pen. One thing I’ll be adding is a piece of felt to the outside of one of the pockets to serve as a needle landing, which is a really easy modification to make. Interested in making your own Typecast letters? Paper pieces, acrylic templates and hardcopies of the pattern guide are available at https://www.paperpieces.com/ , pdf of the pattern guide will be available at: https://shop.wholecirclestudio.com/, and everything is also available wholesale for shops, so ask your local quilt shop to order it for you! Thanks for reading! I hope whatever you're working on is meaningful and rewarding for you. Some links for products are affiliate links. These are products I use, love, and recommend without reservation.